During my London years I had a vast record collection of classical music. I had LPs dating back more than fifty years, including some of the first LPs commercially available in Britain. And that’s in addition to the cassettes, some more than twenty years old, and the CDs, not so old but none the less valuable. But it all got out of hand, too big and too expensive and I had to leave it all behind back in March. It’s the Petrucci Music Library and at present it is home to 46,118 works, 141,663 scores, 5,319 recordings, 6,704 composers and 149 performers. And those numbers are constantly increasing. The only problem is, downloading mp3 files onto my mobile phone is so painfully slow. Last night I downloaded C.P.E. Bach’s Flute Concerto in G major. The total size of the three files is 48MB. They took a total of five hours to download. Just as well I hardly ever receive any calls! Among the things I’ve been doing to establish myself in Downpatrick is build up a new collection of music. It can be Irish trad music or rock or classical or jazz and it can be brand new or it can be music I knew from the first nineteen years of my life, before I moved to England. In fact I’ve been downloading a lot of new songs from www.amazingtunes.com onto my mobile phone. And here’s something remarakable. I discovered on YouTube just yesterday a lot of videos featuring the Channel 4 test card from 1982 to 1986. In those days Channel 4’s programmes didn’t begin until well into the afternoon. 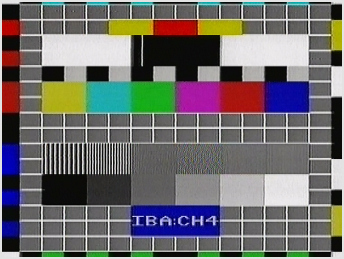 So in order to make up for a whole morning and early afternoon of nothing, Channel 4 broadcast a test card and some fine music to go with it. This happened at a time when I was losing interest in pop music and had stopped following the Top 40. Out of sheer curiosity and to create a little background atmosphere I switched on Channel 4 at a time when I knew there would be no programmes. Now I would be grossly exaggerating if I said I was “blown away” or thought “Wow! This is the next big thing! Move over, Duran Duran and whoever else just happens to be in the Top 10!” No, I gradually warmed to the music to the extent that I regularly recorded bits and pieces of it onto a lot of C-90 and C-60 casettes. I found the instrumental music is better for listening to while reading, studying and idly doodling. Music with English vocals really distracts me. I also noticed that the total music lasted six hours and, for example, if I missed some track at 9:30am I would almost certainly hear it again at 3:30pm. If I had enough patience and enough tapes I would probably have recorded the whole lot in one session! But at some point around about the summer of 1985 I got interested in jazz and I reappropriated all my tapes to recording jazz programmes off the radio. And all the instrumental test card music was lost. Well, I was only 14 at the time. I just didn’t know any better. And now, by heck, here are all those anonymous tunes coming back to me even as I type this entry! Thank goodness for YouTube and people like “cwilliams1976”! Interested? Here’s a link to YouTube to get you started!